ATTITUDE believes that everything that comes into contact with your baby’s skin should be as gentle, pure and natural as possible. That’s why they’ve developed the Sensitive Skin Solution for Baby product line, which includes the Natural Fabric Refresher, specifically developed for babies. Free of worrisome chemical contaminants that can be absorbed by the skin. Enriched with colloidal oatmeal, this Natural Fabric Refresher is non-irritating and helps eliminate odours at their source, without irritating sensitive skin. Colloidal oatmeal is known for its protective, soothing and hydrating properties. Zinc ricinoleate is known for its absorbing properties (odour). Directions: Shake well before use. Spray fabric until slightly damp. 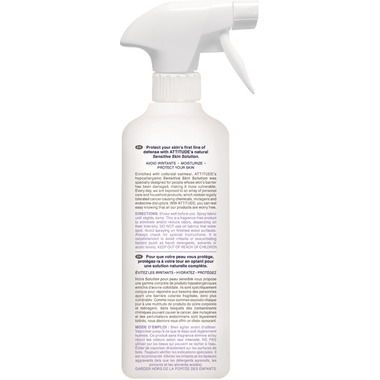 This is a fragrance-free product used to eliminate and/or reduce odours, depending on their intensity. DO NOT use on fabrics that water spot. Avoid spraying on finished wood surfaces. Always check for special instructions. Smells great, but not sure that itâ€™s taking out the breastmilk smell from the glider. I keep spraying on but can keep smelling it after it dries. I use this in my baby's room on the chair and blanket that I use when I'm nursing. I wish it was more scented but prefer it to Febreze which has pretty harsh chemicals. I haven't had a problem with it leaving any residue or staining the fabric on my chair or blanket (chair is microfibre and blanket is cotton).